If you are looking for a safe and dependable car seat, Safety 1st is the way to go. We are giving away a Safety 1st car seat to one lucky winner. 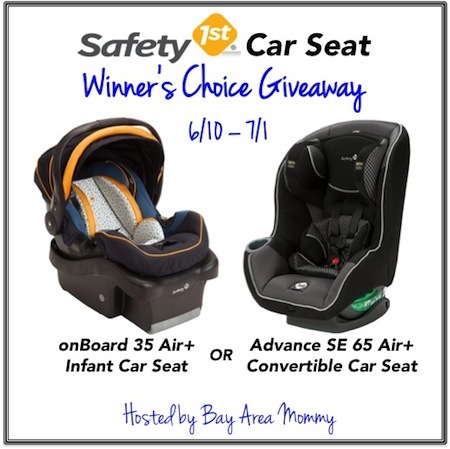 You can select from the Safety 1st onBoard Air 35 Air + infant car seat or Advance SE 65 Air + convertible car seat. One of my favorite things about Safety 1st, their products are 100% made in the USA! Enter to win below and good luck everyone! Father’s Day is fast approaching! Do you have a racing enthusiast on your hands? While Safety 1st can’t arrange for dad to meet his favorite race car driver, their car seats do incorporate the same technology that protects high performance drivers. A leader in safety innovation, Safety 1st’s patented technology is called GCell HXTM which is a foam designed with hexagonal shapes for superior protection around the torso. Combined with Safety 1st’s Air Protect + Technology, they provide full body side impact protection in the event of a crash. The Safety 1st onBoard Air 35 Air + infant car seat features the new Air Protect + to keep children from 4-35 pounds safer in the car. This infant car seat is equipped with a 5-point harness, adjustable stay in the car base and Carry CurveTM Handle with an ergonomic design. The Safety 1st Advance SE 65 Air + convertible car seat features Air Protect + to keep children from 5-65 pounds safer in the car. Better yet, it meets the new requirements for the new 65 Pound LATCH rule. Did you know Dorel Juvenile Group (maker of Safety 1st) is based in Columbus, Indiana where its step stools, potties, car seat bases and child safety products are 100% made in the USA? Check out the brands recent feature on AOL’s This Built America to learn more about the company, how they are helping their local community, and impacting the world in general because of their ever-improving technology! Get a chance to win your choice between the 2 car seats mentioned above! Giveaway is open to residents of the contiguous United States. Must be at least 18 years old to be eligible. Giveaway ends July 1st, 2014 at 11:59pm EST. Void where prohibited by law. No Purchase Necessary. To enter, use the GiveawayTools form below. Good luck! This blog was not compensated for this post and is not responsible for prize fulfillment. Winner will be randomly generated by GiveawayTools and will have 48 hours to respond to Bay Area Mommy’s email informing him/her of winning the giveaway. A new winner will be generated if no response is received within this timeframe. For questions, please email isis (at) bayareamommy.net. I never knew Dorel bought out Cosco. I’m so glad they fought to stay in the US and take such pride in their products. I learned that they are in Indiana. and that they are experts in building child safety products. I learned that today, Dorel is the largest manufacturer of children’s car seats, and one of the last few to do so in the United States. I learned that car crashes remain the leading cause of death for children under 12 years of age.